Hello friends. I recently made a Crocheted Baby Hat and I wanted to make a baby poncho to match and have a set. Here is the baby poncho I made. I was taught how to make this crocheted baby poncho by a lady in the crochet group that I belong to at my church. I enjoyed crocheting this baby poncho and it was not too difficult to make. Here is the detailing at the neck of the poncho. I also weaved through a crocheted chain to use to tie it together. The pattern that I used can be found HERE. 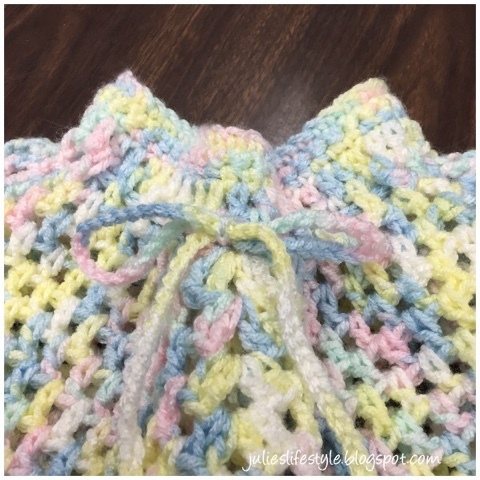 Any kind of baby yarn and colors can be used to make this baby poncho. I used Red Heart yarn in multi colors. The crochet hook I used was a US size H.
I made a few of these for the sale that we had at my church last November. They were a big hit and I decided to crochet another one for this year too. Back in 2013 I also made a crochet baby poncho and hat set, and to see it you can click HERE. I hope I've inspired you to make one for the next baby or grandchild that comes along. Thanks for stopping and wishing you all a wonderful weekend. See you all on Monday for our Cooking and Crafting with J & J Link Up! That is just precious Julie!! That's such a sweet set for a little baby. How sweet is that? So cute! How pretty is that! Love the color and you do beautiful work. Nothing sweeter than crocheted baby items! Breathtaking, Julie!! That baby poncho is totally adorable! So soft and delicate! Pinned and shared. Thanks for linking up at #ThursdayFavoriteThings! I hope you will join me at #OverTheMoon! so loving the pastel colors! such a great design! So pretty baby poncho, Julie! The yarn is so gorgeous! Julie, That is beautiful! Love that multi colored yarn! Thank you for sharing with us at Snickerdoodle Sunday :) Pinned to share. OMG - this is the cutest thing I've seen lately!! What a pretty set! Well done! It's so pretty. I had one like that when I was a baby that was all pink. I've looked everywhere for it. The poncho is adorable, Julie! Some little one is going to look really sweet wearing that with the matching hat. Thank you for sharing and have a lovely week. It is very cute! Wishing you a wonderful Easter! Lovely! It's a perfect match for the baby hat! Thank you for sharing at The Really Crafty Link Party this week! Pinned! Really lovely! You did a great job and the colours are so soft and pretty! Julie, your handwork is so lovely, no surprise they were a big hit at your church sale! Thank you for sharing at Vintage Charm! Oh my! This is such a pretty poncho! I'll definitely have to check out the pattern. Thanks for sharing at Submarine Sunday! What a beautiful poncho, Julie! Thank you so much for sharing it with us at the Hearth and Soul Hop. 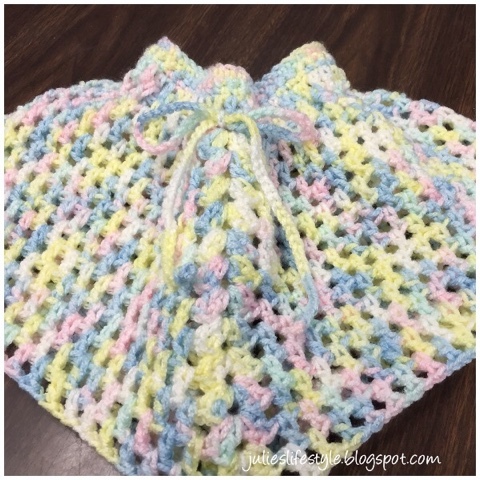 Beautiful Baby poncho Julie, love it, thanks for sharing with Hearth and soul blog hop. pinning and tweeting.